Founded in Auburn, Alabama during the early 90’s, Man Or Astro-Man? soon rose to fame for both their excellent surf music and various gimmicks. Not only did they base songs on horror and sci-fi movies (even including samples from some), but all the members of the band use pseudonyms and claim to actually be aliens from outer space! As a fan of surf music, Godzilla movies and Mystery Science Theater 3000, it was inevitable that I would repeatedly hear about the greatness of Man Or Astro-Man? Not only were they extremely talented musicians, but they did a cover of the theme song for Mystery Science Theater 3000, and included references to Godzilla movies in much of their work, from songs like “King of the Monsters” to albums like “Experiment Zero” (Monster Zero) and “Destroy All Astro-Men!” (Destroy All Monsters). In fact, my love of Japanese monster movies led to my figuring out where the band got their name. While reading a book on Toho films, I noticed that the tag line on the US poster for The Human Vapor read “Is He Man? Or ASTRO-MAN?” Sadly, the band’s releases were all but impossible to obtain in my day and it was only due to my doing the Freaky Tiki Surf-ari that finally lead to me hearing their work. 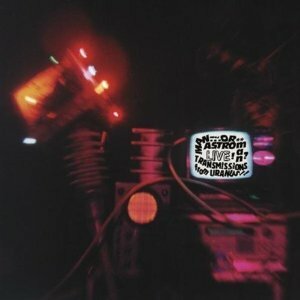 “Live Transmissions From Uranus” is a recording of a 1994 concert in Gainesville, Florida that mostly consisted of material from the albums “Destroy All Astro-Men!” and “Project Infinity.” The performers consist of the founding members “Birdstuff,” “Coco the Electronic Monkey Wizard” and “Star Crunch” (their membership has changed many times over the years). As this is a live show, the majority of the tracks have spoken introductions by the group and constant interaction with the screaming audience. However, my review will only make note of the particularly interesting or funny bits. “Intro Sample” is actually an audio sample from the trailer for The Leech Woman. The first real song is “Transmissions from Uranus,” which opens with a guitar strum and space sounds followed by a band member interacting with a sample from It Conquered The World. The fast, heavy guitar intro adds in some drums and slows down a little afterward. Cymbals pick things back up and we get some lyrics or comments. It slows down a little more, only for the amount of reverb to increase in turn. This song alone is enough to justify their reputation. Next up is a cover of Avengers VI’s “Time Bomb.” Clacking drum sticks lead to fast guitars and drums, along with subdued Hammond organ use and cymbals. There’s definitely a sense of power and urgency to this, just like a time bomb. I found the profanity-filled interaction between the band and the audience preceding “Special Agent Conrad Uno” to be especially humorous. We get drumsticks clack again, then medium guitars (with occasional reverb) and drums form the beat. It builds up until the guitars fade and let drums take over, only to return soon after. The track has a very classic surf feel to it, although some parts have sneaking feel to them. “Sferic Waves” starts with a sample discussing lightning strike victims, followed by guitars and cymbals. They’re fast paced as (thankfully) usual, but this has a different overall feel from the other songs. The guitar styles meander and get a solo at one point, only for the drums to return. It’s not subdued drum use, which is fine by me. Climbing guitar riffs get layered over samples, until they overwhelm said samples as we’re taken out by instrumentals. In case you were wondering, the song title refers to a type of atmospheric phenomena. “Destination Venus” is another cover, this one is by Jo Callis of The Rezillos. Before they start playing, the band jokes about not being an instrumental group and how they usually sing in range so high that humans can’t hear it. So this time, they’ll throw us a bone and lower it to a level we can hear. After launching into plodding drums and medium-light fast guitars, we soon hear them sing about love and going to Venus. The lyrics cleverly refer both to the planet and the legendary love goddess of same name. They pause for the crowd and seem to have ended the song, only continue up until the true ending. The guitars and drums of “Names of Numbers” are fast and full of reverb. The drum beats get quite varied here, with the guitars being just as varied. “A Mouthful of Exhaust” starts with a fairly long and humorous band introduction about rhymes. This track has a very different guitar sound compared to the other songs, which goes very well with the drums. It’s kind of a hybrid with standard rock at times. The band pauses and a member coughs at one point. This is later followed by a sample from game show with low guitar underneath, but things pick up soon after. “Cowboy Playing Bombora” is their unique take on “Bombora” by the Original Surfaris, prompted by a fan wearing a “sneaky space cowboy hat.” Cymbals and wild guitars, coupled with cries of “yee-haw” get things going. There’s lots of interesting variations in this; drums get backed by guitars and vice-versa. It can be somewhat march-like at times, but gets back to “normal” later. It’s very “rock” like at another point, followed by classic surf-style bits. “Mystery Science Theater 3000 Love Theme” is, as you’ve probably guessed, a surf version of the theme from the cult TV series (more specifically, the version of the theme used for the “Joel years” on Comedy Central), complete with “la la las” and “Crooooooow!” Hilariously, the band’s introduction claims that this is the theme to their favorite show…Matlock. If they ever revive MST3K, Best Brains need to use this version as the theme at least once. Trust me, they know about it. Not only did creator/former host Joel Hodgson appear at a 1996 concert to sing along, but his character on the show was said to have done pyrotechnics for the group in his reappearance in the first episode of the show’s final season. “Gargantua’s Last Stand” opens with a sample from the Japanese kaiju classic, War of the Gargantuas. guitars cymbals drums.. cymbals get a good workout here, but also plenty of breaks for the guitars to work their reverb magic. Personally, I feel that the “heaviness” at points in the song is supposed to remind the listener of the marauding green gargantua the song is devoted to. “Surfari” is another cover of a song by the Original Surfaris. The guitars and drums have an appropriately old school feel and sound to them, and the hammond organ returns and practically takes over at one point. However, the guitars eventually reassert their dominance. You’ve got to love the classic reverb outro. “Rovers” starts with long talk about technical issues and a person who got up on stage. A slow intro sample stops things, which soon speed up after. Drums and cymbals take center stage while the guitars back at one point in the song, but as we all know, it wont (and doesn’t) last. starts familiar but gets into a very different song and style after. The Pixies’ “Manta Ray” is the first of the final two cover songs on the album. Light guitars and singing make up the intro, while drum beats and cymbals creep in only for the guitars to pick up later. There’s a very unique guitar solo in this track as well. Jerry Goldsmith’s “Man from F.U.C.K. Y.O.U” marks the last of the album’s cover songs. The Hammond organ and guitars open things, followed by drums. It’s very fast-paced with special riff used whenever the band sings the title organization’s name. The organ is heard the most in this song. “Eric Estrotica” is fast and feels like a road trip. Drums and cymbals are soon joined by a space sound. More precisely, it sounds like something tuning in onto a signal. It really picks up (in terms of both instruments) towards the middle. The sound changes up a bit after the guitar climbing cords, which leads to the drum-heavy ending. Thankfully, Man Or Astro-Man? itself has not come to an end. After ceasing from touring or releasing new material in 2001, the band made a surprise return for two performances in 2006 and the group’s Facebook wall has mentioned new shows for both this and next year. Here’s hoping we’ll be hearing even more great things (and music) from them in the continuing future! Special thanks to Touch and Go Records for the review copy!